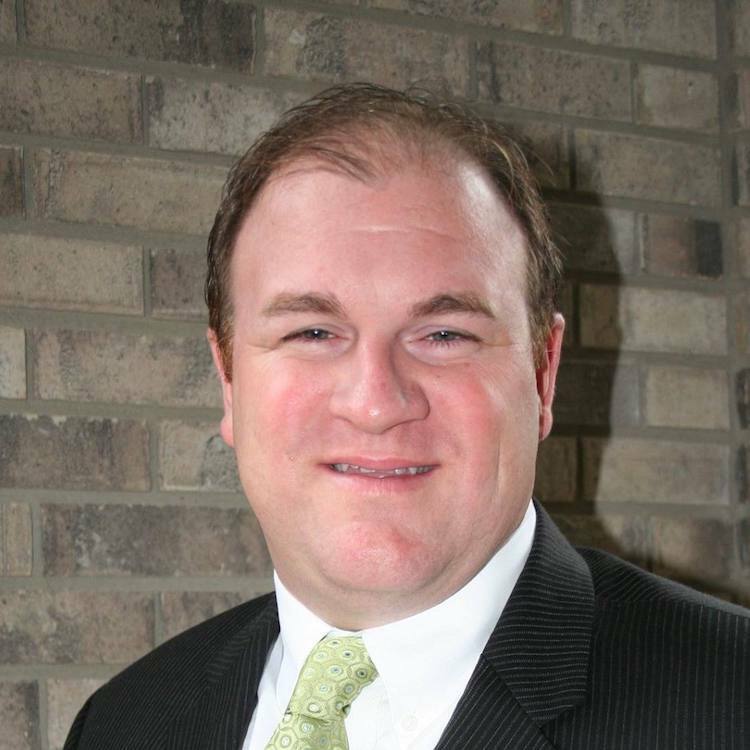 When Kent Castleman became Executive Director of Fort Wayne Trails about two years ago, he thought he knew what to expect. He founded and managed a nonprofit before, and he was passionate about the trails. He figured the job was about advocating on behalf of trails and trail users, working with the City to make sure paths were funded, developed, and maintained. What he didn’t expect was a question that came to mind the second or third month on the job. 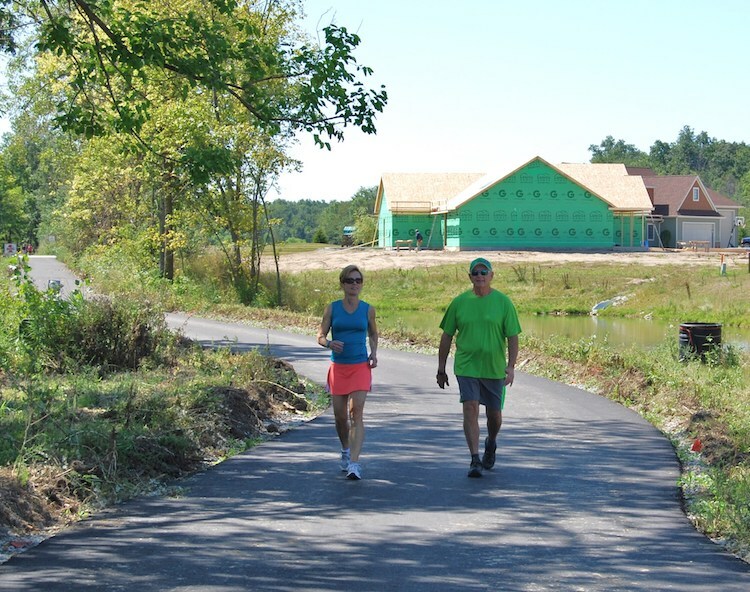 Walkers enjoy a newly built section of the Pufferbelly Trail. It’s a different way of thinking about trails in northeast Indiana. It’s considering them to be something more than a way to enjoy nature, or get exercise, or use alternative modes of transportation. 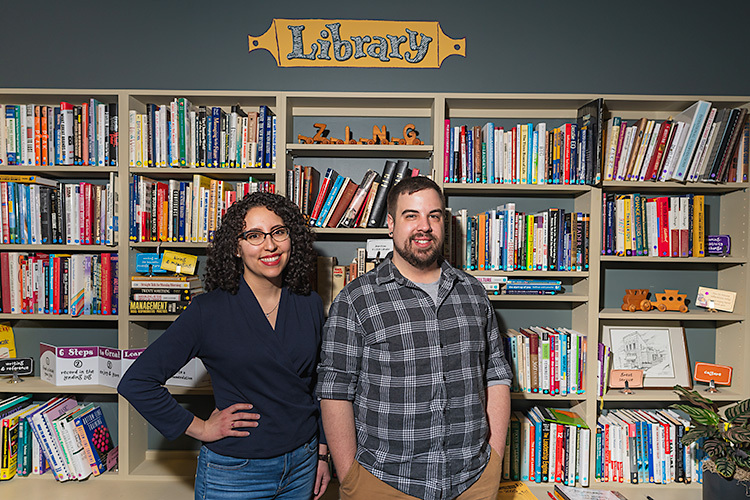 “It goes back to the whole entrepreneurial spirit of the community that you create collision space for people—places where people who wouldn’t normally interact with each other can interact,” Castleman says. 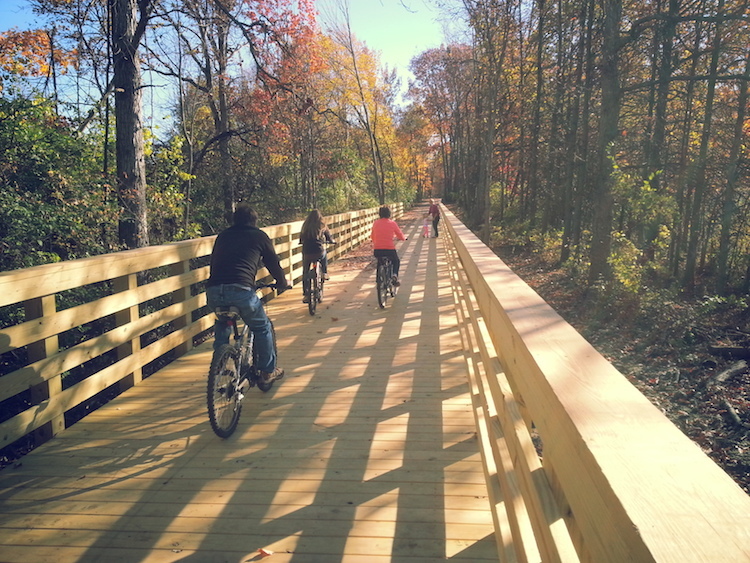 This vision of connectivity is shaping the future of trails in northeast Indiana, and while Allen County already has a vibrant trail system, it’s getting even better. So far, our community has 107.5 mile of trails total, Ritchie says. These trails span Fort Wayne, Allen County, New Haven, Huntertown, Grabill, Leo-Cedarville, and Monroeville. And of these trails, 75 miles are connected. That’s what makes the biggest difference to trail users, Castleman explains. 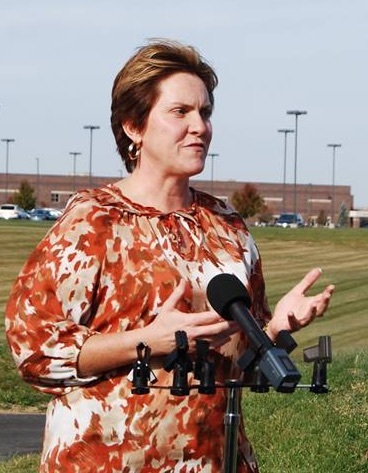 He’s been told by recruiters at Parkview Health that when new doctors are deciding if they want to come to northeast Indiana, a trail network is the third thing they ask about, right after salary and cost of living. Bikers enjoy the trails in Fort Wayne. So Castleman, Ritchie, and other trail advocates are working together to lay the foundation for a connected trail system—not only in Fort Wayne and Allen County, but across the 11-county region. Slowly, but surely, a regional trails network called the Northeast Indiana United Trails is taking shape, and progress is starting with work on the Pufferbelly Trail. 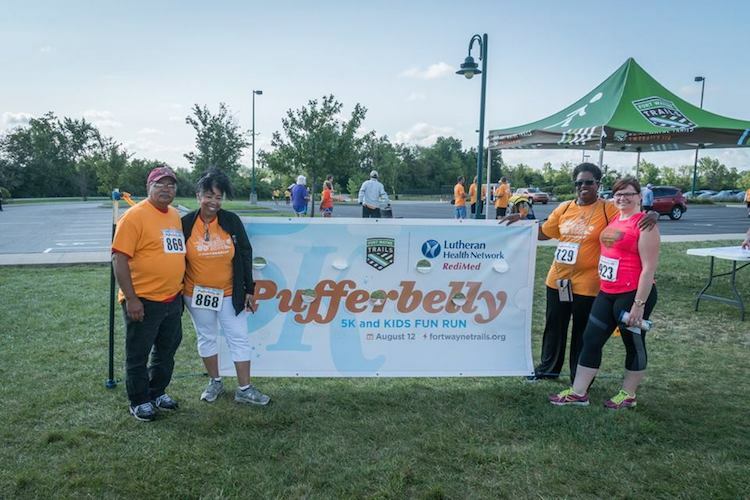 Castleman says the Pufferbelly name comes from a nickname for a steam locomotive because the trail follows an 81-mile stretch of the old Fort Wayne, Jackson and Saginaw (FWJ&S) Railroad between Fort Wayne and Auburn. But what makes the Pufferbelly special today is that it’s part of something bigger than itself. It’s one section of a larger State Visionary Trail called the Poka-Bache Connector that promises to be the longest trail in the state when it’s complete sometime in the next 15 years, Ritchie estimates. 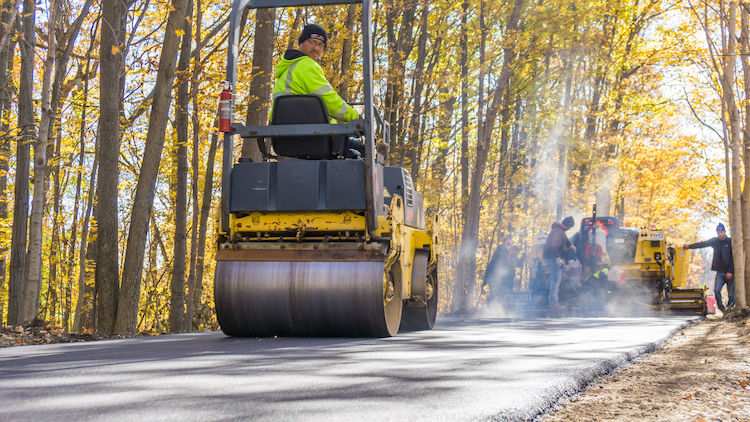 The Poka-Bache Connector will run through four counties from Pokagon State Park in Angola to Ouabache State Park in Bluffton, connecting roughly 60 percent of the region’s population. April showers beat against the windshield of Bill Adams’s black pickup, but he doesn’t seem to mind. He’s smiling, white hair bobbing side to side, as he navigates the North Suburbs of Fort Wayne. He slows down on Gump Road, and rolls down his driver’s side window, pointing to a clearing in the woods—a small grassy trail that cuts through the trees and disappears out of sight. And like that, he’s off again—truck bounding down the road, sloshing through puddles. An old FWJ&S Railroad bridge crossing at Spy Run Creek. Adams is following the old FWJ&S Railroad where the Pufferbelly Trail is going to run. So far, about 30 miles of the trail are complete in Fort Wayne, Bluffton, Auburn, Waterloo, and Angola. New projects are underway this year, too, like the 1.7-mile connection from Gump Road to the trailhead at Life Bridge Church. To help raise funds for these projects, Fort Wayne Trails is hosting Pufferbelly Fest on Saturday, May 12, at Teds Market, where Adams will be leading a short ride to explore the trail so far. The staff at Fort Wayne Trails calls him “Mr. Pufferbelly” for his dedication. But he shrugs it off. If you ask him, he’s just a local guy who likes to ride rail trails, and after following them around the country for the last 18 years, he wants to have one here. Although Adams has lived in Fort Wayne since the mid-80s, he didn’t start riding trails until 2000. 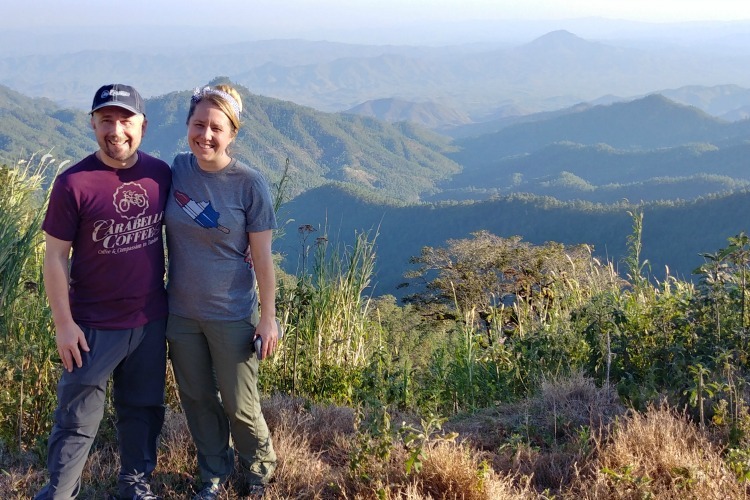 After heart complications and surgery in 1999, he decided to start biking with his wife to stay in shape, and before long, their exercise routine turned into a hobby. They biked a portion of the 200-mile Katy Trail in Missouri along an old rail line and the Fred Marquis Pinellas Trail in Florida with bridges over six-lane highways. “We’ve ridden a lot of rail trails in Georgia, Missouri, Pennsylvania, Florida, Virginia, Colorado, and South Dakota,” Adams says. 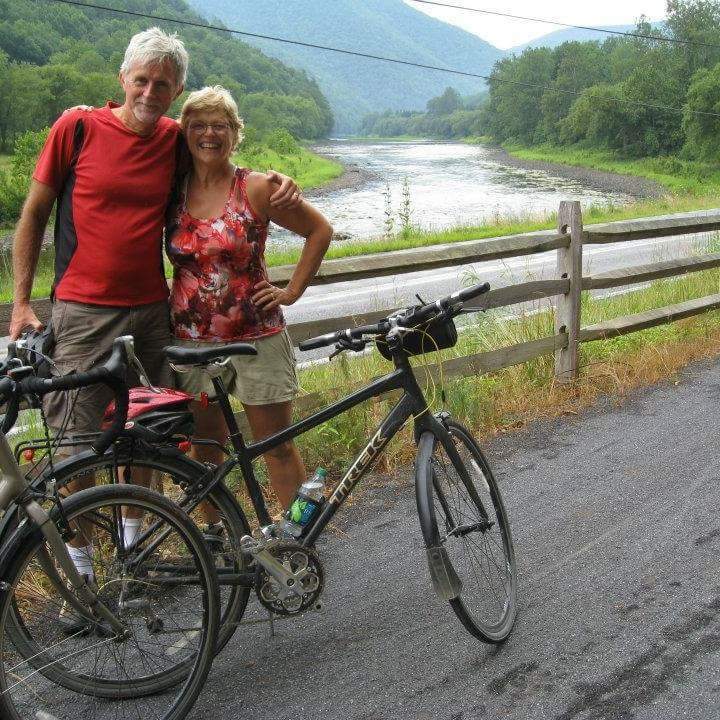 Bill Adams and his wife pose along the Pine Creek Rail Trail in Pennsylvania. He explains that what makes rail trails special is they tend to be more level than other paths because they were originally made for trains. Thus, repurposing them often makes for smoother, more scenic biking away from car traffic. After enjoying these perks in other states, he began to wonder why there wasn’t a rail trail here. He was complaining to a friend about it one day when his friend mentioned the abandoned FWJ&S Railroad. That’s how the idea for the Pufferbelly Trail was born. Adams became a founding member of the Northwest Allen Trails Group in 2004, which took on the project. Then, the group merged with the Aboite New Trails and the Greenway Consortium to form Fort Wayne Trails in 2011. Now, Fort Wayne Trails is making the Pufferbelly Trail a reality. Construction on the old FWJ&S Railroad began in the year 1869. And yet, today’s advocates for the Pufferbelly Trail have been working 14 years to build 30 miles of it in northeast Indiana alone. Volunteers at the annual Pufferbelly 5k Race. Part of the reason is timing, Adams says. 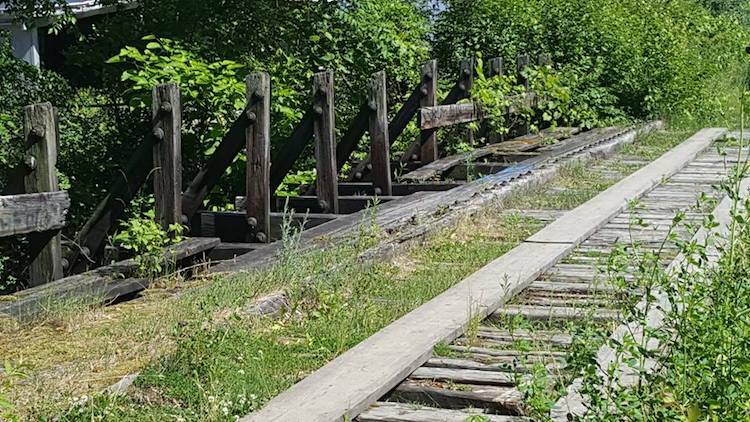 If the old railroad had been immediately claimed and turned into a trail back when it was abandoned in the 1970s, it would have been easier to accomplish. But once developers and private owners bought the land, reacquiring it for public use becomes a challenge, he explains. And while some landowners have been easy to work with; other situations have made things more complicated. For example, parts of the trail that run through wetlands or lands protected by ACREs LandTrust have to be rerouted. Other times, people in neighborhoods where a trail is supposed to run don’t want the public walking through their backyards. The Pufferbelly Trail is under construction in Fort Wayne. Regardless of the situation, Castleman says right-of-way acquiring is the single most laborious element of trail development, next to fundraising. The tricky part is, everything has to work in tandem. He describes it as working on a project with multiple plates in front of you. You pick up one plate, and do some work to acquire right-of-way, raise funds, or design a trail. Then, when you can’t do any more on that plate, you put it down, and pick up the next. 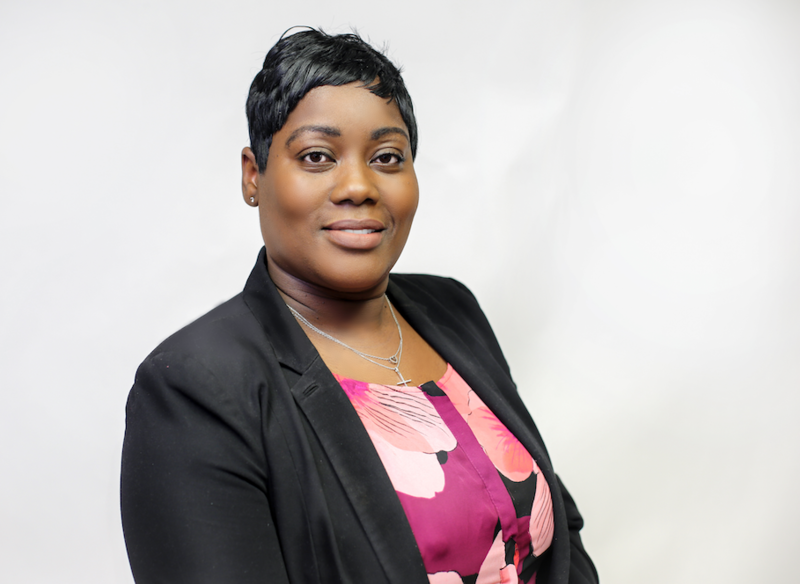 Ritchie has been working on trail projects within the City of Fort Wayne for the last 14 years and has seen momentum growing in recent years as more projects come to fruition. “It’s become a smother process because now we have people who are asking for trails, asking for sidewalks,” she says. That’s where the importance of having a grassroots advocacy organization like Fort Wayne Trails comes into play. While the City manages, maintains, and funds the majority of trail expenses, Fort Wayne Trails generates community support among volunteers like Adams and raises additional funds from private donors and foundations to keep projects on track. The problem is, not all cities in the region have an active group like Fort Wayne Trails working on their behalf. To move the process forward, Fort Wayne Trails is working with other cities to start or rebuild trails organizations there, so the Northeast Indiana United Trails system can eventually connect. In the meantime, Castleman says Fort Wayne Trail users will see more immediate changes within the existing trails to build community there. These trail hubs will be mini parklets in areas where there are not currently many amenities for trail users, Castleman explains. They will have benches, tables, and even art displays. So far, two trail hubs are slated for Fort Wayne: One along the Pufferbelly Trail on the Northeast side of town, and one along the Aboite Trails on the Southwest side of town. Castleman says another update trail users can look forward to is a new Fort Wayne Trails app and website. Students at Indiana Tech and designers at Asher Agency are creating mapping technology to help trail users navigate the trail system this spring and learn about trail closures faster. 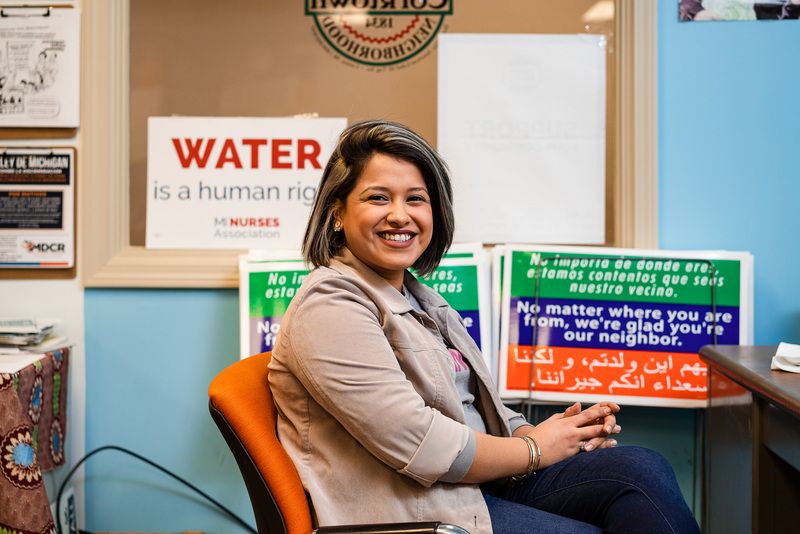 In all the advancements, Ritchie says it boils down to one thing: Creating stronger connections. To help raise funds for the Pufferbelly Trail, Fort Wayne Trails is hosting a Pufferbelly Fest Fun-Raiser on Saturday, May 12, at Teds Market. The day will include a silent auction, activities, food trucks, beer, and opportunities to explore the trail by bike or foot. Watch the Fort Wayne Trails website and social media for details. Trek the Trails is a weekly family-friendly bike ride that is open to the public to explore local trails. It takes place from May through October on Tuesday nights and Saturday mornings. Rides in 2018 begin on May 1, at the Towpath Trailhead at 6 p.m. Saturday rides and hikes begin at 9 a.m. Participants are asked to wear helmets and bring water. Save time and increase your chances to win a bicycle at the end of the season by pre-registering on the Fort Wayne Trails website. The State Visionary Trail is the Poka-Bache Connector from Pokagon State Park in Angola to Ouabache State Park in Bluffton. Last year, the Pufferbelly Trail was connected from Wallen Road to Ludwig Road and State Street to Fernhill Avenue, which is set to be complete in early June. Another portion of the Poka-Bache Connector along Bluffton Road—between Lower Huntington Road and Winchester Road—was also paved, with restoration still underway. The next big push in Allen County is connecting Gump Road to the trailhead at Life Bridge Church 1.7 miles away. The City of Fort Wayne is also working on connecting Ludwig Road down to Washington Center Road in 2018 and Washington Center Road to Ice Way in the near future. They’re creating a below-grade crossing of Dupont Road, as well, which will be open around the end of November this year, allowing bikers to get from the North Suburbs to Salomon Farm Park. Closer to downtown, other parts of the Pufferbelly Trail are underway between Fourth Street and State Boulevard in front of Science Central along Clinton Street, which will connect to the State Street bridge overpass in 2019. 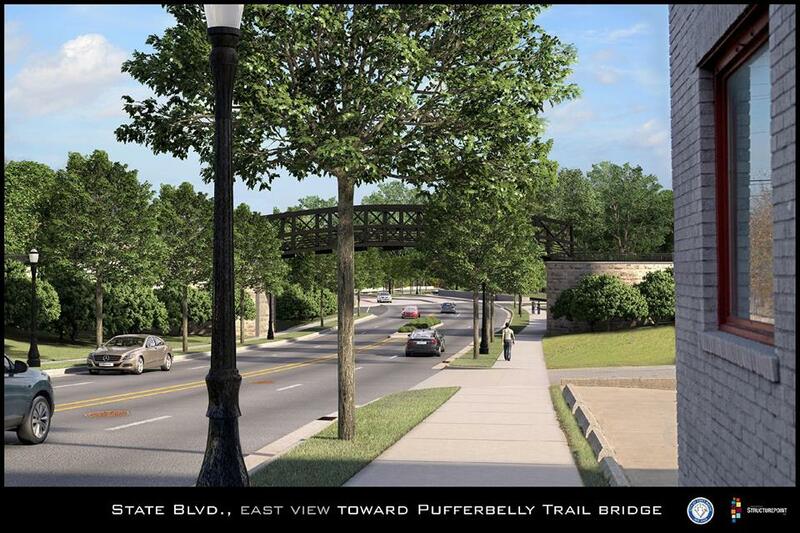 A rendering of the future Pufferbelly Trail Bridge over State Street.